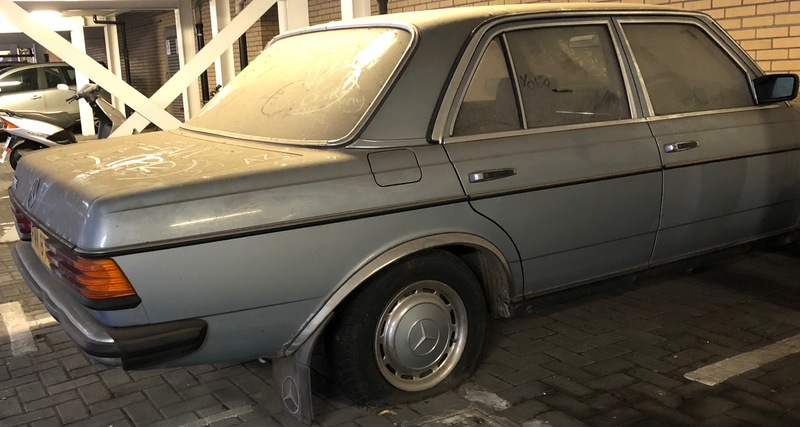 This mid-80s Mercedes 230E – a beautiful car – shares a garage with me. It’s been there since I moved into my flat last summer and clearly hasn’t been touched by anybody other than kids. The grime was there when I moved in, as were the flat tyres you can’t see in that photo. I don’t know who owns it – the parking spaces are numbered, but don’t correspond to any system I’m privy to; the person who parks next to me lives in a completely different block – but I’m assuming the residents’ association does. The garage is a private one, residents only, and if you park when you shouldn’t you’ll have a letter on your windscreen before you’ve even got the key out of the ignition. I’m intrigued by the possibilities, because this is costing somebody money: the garage is part of the deal here, and if you’re an owner you pay ongoing fees for it, for the lifts and for other communal things. If like me you rent, part of the rent covers that. So clearly somebody’s paying. That probably rules out death. A dead tenant pays no rent; a dead owner pays no service charges. Unless they’ve paid for a year or more up-front, of course. Maybe the person is alive, but elsewhere. Maybe they work overseas. Would you keep paying service charges for a place you don’t stay in? Maybe, if you own the property and intend to keep it for many more years. Or maybe the owner is still there. Maybe they can’t use it any more because of mobility issues. But if the car can’t be used, or won’t be for very long periods, wouldn’t you sell it? 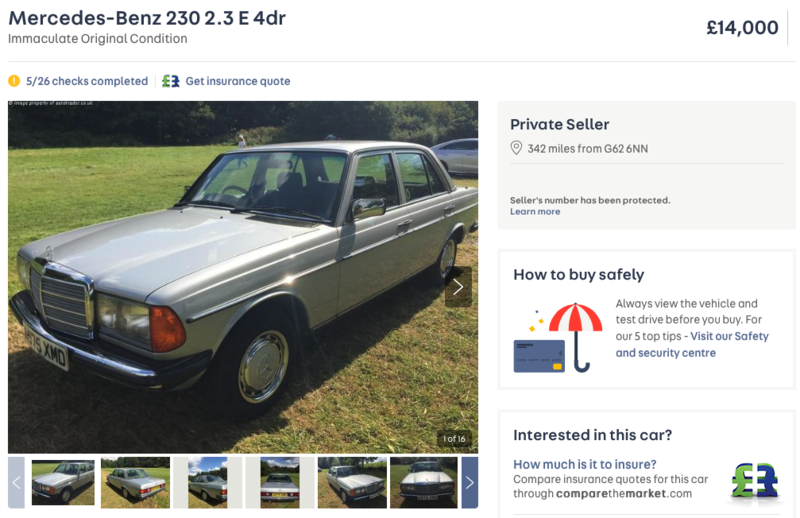 It’s a W123, the last of the bombproof Mercs, and they’re still in demand: I’m currently looking at the same model, in roughly the same condition, on a 1984 A-plate. It’s on Auto Trader for £14,000. That one’s unusual, though: barely driven, having spent most of its life in sunny Cyprus and used occasionally as a holiday car. This one’s rotting away in considerably less sunny Partick, and clearly worth considerably less money. They can’t be keeping it as an investment. They’d have washed it occasionally, or covered it up. They wouldn’t have left it looking like this. This is a car that was loved, or at least looked after. Beneath the grime the chrome still shines; the sky blue paint still shimmers. 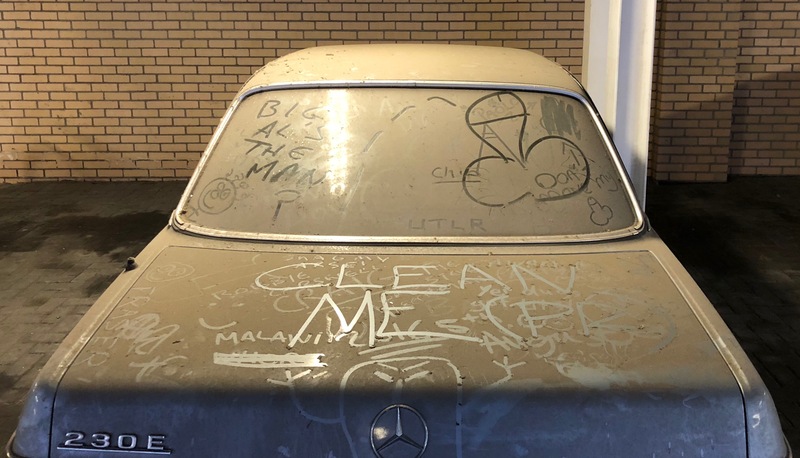 Somebody cared about this car once, and yet here it is with flat tyres, a patina of grime and crude graffiti. The owner lives, or lived, in the same flats as me, no more than a stone’s throw from where I’m writing this. And yet I’ve never seen them, and I suspect I never will. Update, 14/3: The car owner filed a SORN (statutory off-road notification) in 2012. The car’s been parked longer than I thought.